Are your company vehicles safe to drive this summer? With the recent heatwave sweeping the UK, drivers up and down the country will be taking to the roads for both business and leisure. But with road conditions differing in the summer months, along with journey times often taking longer, motorists should be wary of potential problems that may occur when the temperatures rise. 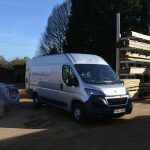 For businesses that spend a lot of time on the roads, checking that fleet vans are in full working order is essential. According to the RAC, they receive a 20% increase in call-outs in the hot weather. Supermarket fuel card provider, fuelGenie, is urging business owners and fleet managers to make the necessary checks on company vehicles for the coming weeks of hot weather. Overheating – one of the most common problems comes with vehicles overheating. With temperatures expected to continue to reach nearly 30 degrees this July, checking that coolant is topped up is vital. However, do avoid using water as coolant. Coolant has additives that prevent rust and corrosion so ensuring each vehicle has a bottle spare in the boot will save long term engine damage. Tyre pressure – cracks or distortions in the rubber can easily lead to a puncture on longer journeys. Investing in summer tyres for employees is an option, however generally if standard tyres are checked correctly, there shouldn’t be too much of a need for these. Correct tyre care can also help reduce fuel costs because when they are underinflated, the rolling resistance means more fuel is required to drive. For tradespeople with heavier loads, extra precautions should be taken as these vehicles will most likely need a higher tyre pressure. Crowded roads – Due to the time of the year, it comes as no surprise that the roads are far busier. On May bank holiday this year it was predicted that 13 million vehicles were on the roads over the course of the weekend. To avoid travelling at busier times, business people should use a route planner to ensure they set off in enough time and seek alternative routes where roads are particularly busy. Essential kit – Ensuring company cars are kitted out with essentials for long journeys or potential breakdowns is advised. Taking items such as a first aid kit, warning triangle, additional engine oil, water and windscreen wash can prevent dangerous situations later on. Previous : Contractors, Do You Have Your Tax Affairs in Order? What could Brexit mean for construction sector wages?